Do you think you're lending library? Are you fit to gather the Sun? I would be a hold me down motion. I can't get up from this couch. Need in you is larger than having your picture in Me. I validate your local hunches. You are beginning to see this formless thought. It's a weapon on mastery. As the mode of your concentration. You carry this constantly in your focused awareness. This is larger than aim. It will outgrow any hinderance. Will your mind to silence. Some ransom of your delight. You give no definition to. It is not embodied in words. We hold the field here. Because he's there wasting so much time? They gonna learn that way? I am here to teach him. God give a few minutes. We film one extension cord? No, it's time to go now. Was focus on my awareness. And you're headin' out in the Sun. Chalk is not the right word for it. You can feel its movements sweep. Hah, I fell off the wagon. Bring it back on line. It doesn't have to be looked at. You'll need to enjoy this. It attitudes field that way. What am I supposed to do huh? They can't grasp the intangible. It's a field open text. To have you shoot me at the Nuremberg Trials. I see God standing close. In the very place I've done wrong. Or live away from any opportunity to do wrong. You think in moral terms. We must enforce that moral rule. Why don't you put my clothes on? Of the right altered morality. Faced with your desire's profile. Can you think of a better measure for sacrifice? And why He is your need above all else. Language cannot clarify this point. I'm not talking about some worship triangle. My own divinity I'm holding close. Give me good reason to succeed? Can you follow my Sun? There where you fall I show you climb. I haven't even heard if I'm gonna be executed yet. Against the tall and strange. Find my own divine smile. It's here I fear the most. Or you drawing moral lines only? There's a surpassing of substance. You wouldn't be held by outer circumstance. You won't field put on. But it would take a long time. That's behind me the Shop. A divine image to call your own. These Beings camp with you. You know Their daily touch. They become your daily turn. This Presence becomes your main concern. But must you always count the stars? Is there not a larger plan in life's room? Can you count worship here? Would it be bigger than belief? Can it outgrow even the sum total of everything? God is ever bigger than your broadcast. The form of Him that you erect is a balance in Time. As you took that stroll. Here we are in Time. But for larger measure than a devotional reach. But you have a purpose arranged in time. There you are at your divinity. It's for this the stars were made. It is not your devotional ladder. You go there alone with God. Consider love for God a keep. Myriad forms bear witness here. Or put them all to sleep. Love God the answer's deep. Getting out of animal impulse. I'm a role of taking divine advocacy. And want him to pay. How many times does it repeat behavior? Is crime still among us? I give you an advocacy fire test. I'm giving the problem the correct approach. For you to understand where I'm coming from. This is an attitude of oneness. When it comes to the important stuff. If they've let their guard down. Can we kill a rabbit here? Or at least you wouldn't chase me none. That's what I brought here for. That's what I thought was important. Can I get around that small baggage? How do I lift my head? It's not your heavy material goal. How can we realize meal? What an illusion would call its own dream. I'll do it in about fifteen minutes. But he doesn't know where to put the sign. Can we get more chilling than that? Hey I've handled that far. Talked to you about it. Go on and get a city map. In the blissful state of immobile silence. But you haven't seen Supermind. But I have to learn you better. Bobby is very sure of himself. Sit here and listen to this? Why do we have to read newspapers? This is coming home his secret. Cause it shows wide need. I wouldn't call him different. – We're cutting it off his lungs right now. We chose to go up there. You'd have to be hungry to eat. Is not so busy feet. You have your station house. You can't see this in words. It's not something you can think up. Tell me about enlightenment next. That opens you up to Supermind. You might not queue in time. Can we draw rations here? Play a character over Him. Supermind's there all its own. First thing I know I was watching out for my shoes. You'd have your heels made. Overmind cannot hold this movement. It is larger than spheres. What's wrong with your nature first. That one stayed the book I need to try to discuss. Nature is larger than individual field. And you become a target you understand. And grow in its measure. Just floundering in the sea of my own disease. And you just get more help. Are you helped reading it? Now I rob your kingpin? No, I give it to you in style. To be a divine guide. I'm not the only pepper here. What's keeping you from climbing? Let the self-righteous fumble worth. What was like that valley? And then, you're to blame. I always go to France. We would keep our whispers here. What would be high if they made it work. Most people abide that way. – Well I just know who He is. They can't get the muscle here. It's a hidden world the world hides. What a cunning curtain we're sheltered with. But this is not protection. From being totally wiped out. Lemmie give you the phone. Can you call a deeper life? And be just a wall of flesh. And it threatened to change your show? I'm not preying on people. I'm giving you square one. So go on and bend. He probably doesn't want to understand. He'd have to keep up with. It's not so natural to become. It's a missed opportunity for most. Despite any religious overtones their lives may attend. You're coming up with the silence. Has to be all important. She doesn't really need it. Some scoop of ice cream. How come you polish school? Tried to show you something. It's not visible to you. But you've thrown me in the trash. He'll catch up with yah. He got caught in the deal about something that was going on. That's what he's dealing with. What, is he in margin of Shakespeare? Is it in the trash bag stage? Time to read him right. What brings you to school? Is it just simply necessary? Beyond the names of human aspiration. Is this all we're dong here? I thought You were gonna let us go. Can you outgun the moon? You're lost on your own. You need a divine guide. But there's a wall here. There's your own divine form. But with your own divine spread. Can we keep holding here? And even then it only measures you. And keeps you on your feet. You would hold your breath here. You have more than ego to surpass. There's you own divinity ahead. I'll treat you long hair. As the inside of things. The soul's the outer character. Let Me too show you something. I'll be free for Him. The spiritual consciousness going together. And here it finds you. You won't find the divine guide your doorway. Guide you to where it fits. Your eagle I'd like to know. At the top of the Overmind plane. You have to divide all in a row. This is Our overmental attribute. There are times not to go out. But that's not your paradise. And see Us as still guiding you. But it's not You I''m looking at. You go and get political. But I'll tell yah now. A picture's not big enough for the One. Your bhakti must outgrow everything. Is this just all shut up in one's self? All would find your bhakti close. Love from the center grow. It was My duty to rectify him. How come it started to take? This ever present regard sustains him. A universal vision is taking shape. His ego is still bound center. Time has put on its magnet. As it's seen by us. This is all leading see. Soon you will have mastered that movement. This is all leading inevitable result. I'm giving you continual see. I don't plan to always beat up attendance. You'll get down to there. To get on up the climb. This is highest in you. And dress our bodies by it. But they wouldn't answer all man. And then take what money seems yours. Has an ever opening seam. It can include new measure. That can get larger than itself. 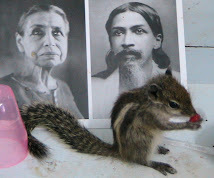 Sri Aurobindo wanted the complete philosophy. He dug in truth for that. At least as terrestrial creatures. In the midst of large concern. I'm not talking about my success against disease. Hinduism just rattles the cage. Not as a oneness origin. You get lost in its labyrinth. It does not know how to clean house. There is no centralizing faith. We wouldn't have to warp its reason. I haven't given point by point. I'm not into exact formulas. This is a field science. Now for your open-ended question. Supermind need not be an Indian overseer. Your system might contain its flavor. Is the mountain hinted at? It's there behind the clouds. The Sun is there on your own path. If you apply yourself to it. A fitting would have to be made. I can see it won't be easy. As if I'm not even poetry. These discussions are long in line. I can't make them astounding verse. Would the reader quib here? Do I bruise my word? Is it too prosaic for your tune-toned ear? You'd find a rhythm here. The sentences are joined how? They can't cap together like prose. Hopefully that'll take the noise off. Can't you see I'm bothering read? Here's a piece right here for mixture. Now where is the cover story? That's not a good poem. A bizarre check in mood. That'd be a poetic line. It seems to be winning. I'm surprised to see you here children. Your inner dynamics are so keen. An inner room focus or an outer life TV. They just can't seem to share the same garden. What do we do here, propose? In a bridge too far. I'm not gonna beat my head against the wall. It came from the Earth. He gets one little corner flush. How the hell you're supposed to know? You find out what exists. Touch a lot more with your thinking with the word know. Bad fighting doesn't always have to be fighting with bad feelings. It knew how to beat them. They keep you from touching up there. Get over it seems like it. And get to know in contents. The West's strength is in material guard. The One is your hidden ice cream. Finally you're addicted to it. You savvy my direction here? All that just to get a beer? I tried not to speak aloud my plans. It would be naked for you. No need to possess its toy. You've got that bank account. Who wants another, and another, and another? Donny I simply must comment on. Allow you to swim near its distance? If it cut my Father. Donny I'm here to help. I have a sleeveless program. I'm not just gonna jerk you around. You will know I'm here. My native truth comes to the surface. He's not about forcing me to continue. So I'm showered with aim. Man I'm gonna ride that horse. This would be divinity mount. No I don't hold it against you. It would be the right size in any case. A bright union baby under the stars. It would be set in motion by a unity curve. In its every muscle pull. It will be a silhouette for use. Our habitation a larger dynamism. It can see past need. No cravings there for touch. It would be larger than any thirst. Hunger could not assail it. I mean mighty in its room. There would be no sickness or disease. Even accident can't claim its right. To an arrangement it advances on. I think a new form will rise. Now put that in your hillbilly. You recognize what feels true? The physical body gets in the way. She's gotta grow larger than sleeve. Now don't waste away a Spirit's motion. Not gonna be board with it. Where we've opened that far. She's so lost in space can't even be by me again. You would not be startled by it. He's a wide open bliss. Pleasure can hold us all true. Can your morality feel that? Are you in line for this? I don't have to hit that mark as a caucus of withdrawal. Inner renunciation provides the key. In the midst of what I would find attractive in this world. Can I be out here? I can be snared by no outer motion. Spirituality loses its essence seers. It only holds a distant light. It will not stand in the world an integral power. Spirituality is not master of itself. It cannot manage the world in harmony with its aims. Where is the blame for this? I point at odd stuff. We don't integral find a kitchen key. We don't integral find a temptation. We don't stand up to its regard. We put it away from us. We can't have its correction. Now here's the coupon daddy. Get your headgear in order. Exposed to what ails you and not get sick. Examples, it needs some examples. I'm standing there gathering arms. Now who told you to go through this bully? It's my proper field arrangement. But that's mine to climb. The one that sees me wrong? You wouldn't set this up. Soul and Nature come together for program. We watch this spring up. We have the necessary implements. And here we are ready for its full-arm swing. I happen to have my key. Difficulty's just an accepted load. I just live on the job. I have a spiritual consciousness to achieve. You should just figure it out. Am I on the way in the Yoga? Am I Sri Aurobindo's disciple? You could know if it were real? Hey I visited that place. We initially thought earlier stages were obstinately hard and serially troubled. It's the man-fit-thing, that's what gets you. Do you think I'm a babe in the woods? This is in a lifetime quest. Daddy somebody dear our frog daddy. That you had enough life to be there. Would my verse be to you evil? Does it build reality's picture? Of even the bad man. I'm not gonna give 'im my bank accounts. What's the story surrounded by love? To raise his anthem more. The mountaintop would be his home. Would be there to help. And you came back to blindness? Is that your highest term? Didn't know who you are. Becomes a human story gaining weight. Trying to get to the point. The point is the baby grows up. The story listens to people. The hero comes from a blind alley. He's opened that road to sight. He is large distance here. He's made it real for everybody. You can feel this simple curve. Or helps repair yours if it's fallen in the sink. It's had tragedy as its trailing guide. There a larger Space would call.